As outlined in my Belated Birthday post, I'm changing focus this year to look at Spanish cinema from a different angle; I'm going to investigate what Caimán Cuadernos de Cine have called 'el otro cine español' and also the increasingly noticeable trend for 'cine low cost'. I'm at the viewing stage of this project at the moment, and expect to be for a while. 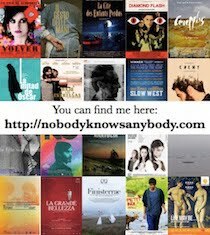 I'm currently working my way through Intermedio's Pere Portabella boxset, which may seem like going off at a tangent but I actually think that it would be difficult to discuss 'non-mainstream' cinema originating from Spain (and the autonomous communities) without looking at his career, because what's happening now is not completely 'new': there have always been 'other' cinema(s) at play, but perhaps the perception has 'resurfaced' or these films have become more visible in the past 12-18 months (for a variety of reasons to be expanded on at a later date). Of Portabella's 6 features and 16 shorts, I have 2 features and 5 shorts left to watch (which is uncommonly speedy for me): I will write about the set once I've finished it. At the same time, I've been taking Caimán's list of 52 directors who they think pertain to this 'other' cinema as a jumping off point for my viewing. I have issues with the list (and, again, I'll come back to that at a later date), but it's as good a starting point as any, and has introduced me to some names I didn't know. But I am also looking at directors not on the list, who don't fit Caimán's criteria but who seem to me to be ploughing a similar field. I'm not going to write about every film at the time of viewing, and there are some that I probably won't return to later either, but I want some kind of record of progress on here: I'm going to post a still from each film viewed and tag it 'project 2014' (if it relates to this) [UPDATE (Dec 2014): As the project will be continuing in 2015, I'm going back through the posts to change the tag to just 'project']. Rather than post what I've watched so far all at once, I'm going to schedule an image to be posted each day this coming week. I'm not going to post any of the Portabella ones because I am going to write about them soon. The 'other' cinema and 'cine low cost' overlap but they are not synonymous, so I will probably tag the images with one or the other (or both) of those as well, but I'm starting primarily with the former.